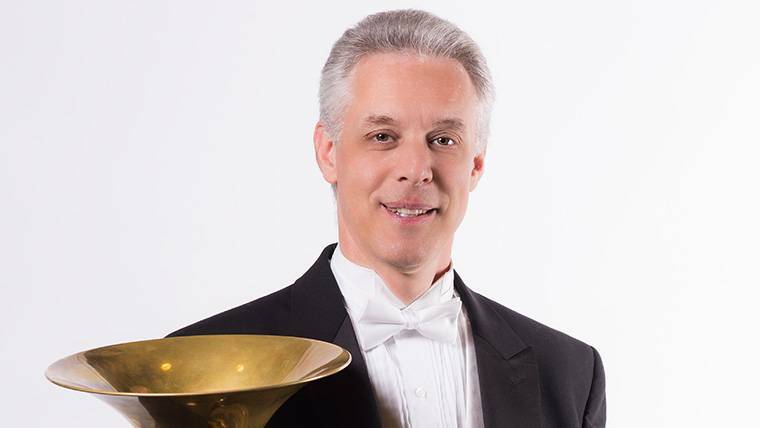 Dan Malloy Jr is currently fourth horn of Orchestra Iowa as well as Principal Horn of the WCF Symphony. After graduating from Oelwein Community High School, he attended the University of Northern Iowa where he received a BA in Music in 1986. He performed in the Brasilian Symphony Orchestra in Rio de Janerio for two and a half seasons before returning to the States and joining the WCFSO (in 1990) as third horn. Dan lives in Cedar Rapids, where he maintains a studio of hornists from grades 5-12. In his spare time, he, his wife and daughter like to be outdoors, hiking and riding their bikes. He also tunes pianos and loves to golf. This is always a hard question to answer. As a horn player, anything by Strauss, Mahler or Brahms ranks pretty high. In no particular order…Stravinsky’s Rite of Spring, Bartok’s Miraculous Mandarin, Mahler 5, Tchaikovsky 5. Usually a ‘favorite’ ends up being a piece that we are currently working on. Each new concert brings up another favorite. Probably playing Schumann’s Konzertstuck for 4 Horns with Orchestra Iowa…3 times in 3 days!! Also the concert for the grand re-opening of the Paramount after the flood of 2008. Growing up, the horn soloists Hermann Baumann and Barry Tuckwell seemed to be playing on my turntable a fair amount. Back in the late 80’s and 90’s I liked the sound of the Montreal horn section as well as the Chicago horns. Currently I like the Berlin Phil. horns…Stefan Dohr, Sarah Willis. I have no idea. Music has always been a part of my life. I guess as a youngster reading many of the Hardy Boys books, I wanted to be a detective. At this point I would probably have to say Donald Sutherland. Must be the beard I am currently sporting!